Low Price Far Infrared Sauna? A low price far infrared sauna can be a great investment for your health and a good method to relieve your aches and pains. But here is something to consider. If you are likely to be using it to relieve localized aches and pains then units such as shown on this page can be much more effective than a full, walk-in sauna. And a walk-in sauna will never be low-priced anyway. A localized application of far infrared can actually be more effective for pain relief. This is because of how far infrared affects the body. Applied to, for example, a sore elbow, it will increase the temperature up to two inches below the skin. The body, in its attempt to maintain homeostasis, reacts to this by sending extra blood flow to the warmer area to remove the excess heat. This brings extra oxygen and nutrients and removes toxins more quickly and is just what is needed for healing to occur. If the whole body is warmed, there can be no relative increase in circulation to one body part and therefore there would be less localized healing. While a walk-in sauna definitely has benefits, if you are looking for a low price far infrared sauna and this is your situation then you are on the right website. 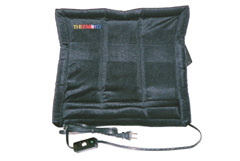 Thermotex far infrared heating pads are registered medical devices with both Health Canada, and the US Food and Drug Administration that are guaranteed to relieve your pain within 30 days (excluding professional, pet and equine models) or you may return the unit for a refund of your purchase price. For hygenic and health reasons used pet beds are not returnable. Pet products include a one-year warranty on parts and labour. See descriptions of models for cats. See descriptions of models for dogs. Thermotex units are registered medical devices. They are a one-time expense, have many uses, can be used by the whole family and come with a 30-day money back guarantee (For personal products excluding the professional model). You have nothing to risk. The company has tracked returns and has a 0.66% return rate - that is about 7 units per thousand. Returns for servicing because of (usually minor) problems are about 1 unit every 2-3 weeks from hundreds of thousands of units sold. The picture to the right shows the most popular model, the Thermotex platinum. This is the most versatile model. It has three elements so that it can be bent to conform to different shapes for various applications. 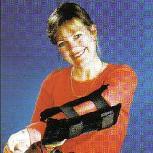 There are other models designed for specific applications such as the wrist, knee, elbow etc. These would be the best to use for those particular body parts but might be awkward to use in other places. There are even units for pets all the way up to horses (ask me about those). If you are looking for pain relief and have been considering a low price far infrared sauna take a look at Thermotex - it may be all you need and may give you the best value for your hard-earned dollars. Want to get back in the game? Pain from injury and chronic ailments can be debilitating and keep you from participating in the activities you enjoy. The deep-heating effect of far infra red increases circulation to the applied area and speeds healing as it relieves pain. Let's say you spend $270 (including the shipping and taxes) for a platinum unit. A Thermotex is a quality, approved medical device. It could easily give you ten years of service (and perhaps much more). That becomes an annual cost of $27 or $2.25/month. Compare that to the cost of, for instance, a monthly supply of an anti-inflammatory or pain-relief product. It is a one-time purchase compared a bottle of some supplement that may be gone in a month. If the pain relief you get from it can save you from missing even one day of work a year it will pay for itself multiple times. It can be used by the whole family for a wide variety of aches and pains. For a complete list of the physical benefits, go to thermotex benefits. Remember also that Thermotex units are guaranteed to relieve your pain within 30 days or you can return it for a refund. So there is no risk other than you pay to send it back if you need to. Learn of how others have been helped by using Thermotex far infrared units to relieve their aches and pains. Infrared is part of the electromagnetic spectrum. Learn about the electromagnetic spectrum and how it relates to pain relief. Thermotex far infrared units can be effective at relieving chronic pain - they are registered medical devices. Learn how they work. If you have back pain, muscle spasms, knee pain etc., see graphic evidence of how a thermotex can help relieve your pain. Learn how localized hyperthermia can relieve pain, speed healing and increase health. Read how far infrared can help the blood vessels and circulation to maintain homeostasis and even guard against developing cancer. Results from a clinical study showing a high rate of pain relief from people using ThermotexTM far-infrared heating pads.